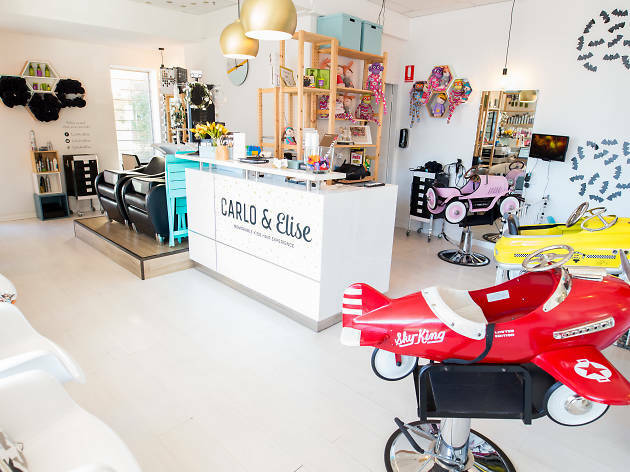 This smart little salon specialises in children’s hair. 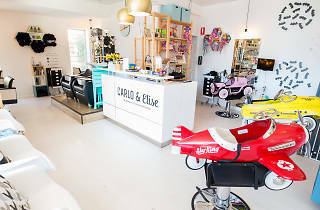 Inside, your scissor-phobic tyke can choose from a little red airplane, yellow taxi or pink jalopy to sit in while the stylists work their magic. There's even a flatscreen in front of each chair that broadcasts the Wiggles on high rotation. Two well behaved littlies are sitting quietly within their chosen vehicle when Time Out walks in with its moody two year old for a much needed trim. But, try as we might, we cannot get him to sit in that plane cockpit for love or money. In the end we are forced to clutch him in our arms while the stylist carefully snips at the screaming boy's curls. Hairs and tears fall on Time Out's shoulders while our laconic cutter, Inez, murmurs gruff encouragement and miraculously achieves a nice cut in spite of the child's over-the-top protestations. Afterwards she even inflates a balloon for him and lets him dig around the toy box in the corner. Peace is restored – and we can also see our child's face again. In fact, he now looks like a little angel. Though kids are their focus Carlo & Elise also cut hair for the whole family, as well as providing upstyles and blow waves, plus colouring services for teens and adults. A basic cut is $30, and they don't charge any extra for the child psychology. Money well spent, in our book. Bookings can be made online.